To celebrate the 100th edition of the Tour de France, and the mountains that have made it legendary, Rapha and Strava are proud to announce Rapha Rising: La Centième. In the week which starts on Bastille Day (14th-21st July), Rapha is challenging participating riders to climb the combined height, from sea level, of the Peyresourde, Ventoux and Col de Sarenne, all of which feature in this year’s race. The Peyresourde is one of the giants of the Pyrenees, which featured in the Tour's first excursion into the bear-infested mountains in 1910, while Mont Ventoux, the Giant of Provence, first appeared in the Tour in 1951, a year before Alpe d'Huez. Together, they've been the sites of some of the Tour's most famous battles. The Col de Sarenne, however, has never been scaled in the Tour. It’s a little known col, 1,999m high, that the pros will climb this year, having first climbed the Alpe. Descending on a road resurfaced especially for them, they will loop back round to the foot of the Alpe to make that climb again. Just as the pros will have to scale Alpe d’Huez twice, Rapha is challenging riders to scale the Alpe once more, making a total climbing distance of 7,235m (23,737ft), the combined elevations of the Peyresourde, Ventoux, Sarenne and Alpe d’Huez from sea level to top. 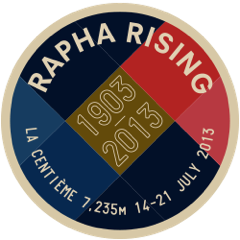 Riders that successfully climb 7,235m (23,737ft) within the Challenge period (July 14th - July 21st) will receive a commemorative Rapha Rising woven roundel for their efforts. Athletes that complete the challenge of climbing 7,235m (23,737ft) between July 14th and July 21st will receive a Rapha Rising woven roundel to commemorate their achievement. The Challenge starts and ends based on each athletes local time zone. All activities logged during the Challenge period must be uploaded to Strava no later than July 24th, 2013. Strava (“Sponsor”) is pleased to introduce the Rapha Rising: La Centième (the “Skill Challenge”) made available at www.strava.com (the “Site”). As a condition of participating in the Skill Challenge, entrant (“You” or “Your”) agrees to be fully and unconditionally bound by these Official Rules and the decisions of Strava, whose decisions shall be final and binding in all respects, and to waive any right to claim ambiguity in the Skill Challenge or these Official Rules. You may enter the Skill Challenge by going to the Site on or before 07/21/13, clicking on the corresponding Skill Challenge URL that will direct You to the Skill Challenge landing page, where You will be entered into the Skill Challenge by clicking on the Join button. Starting from the day the Skill Challenge begins on 07/14/13, you have until 07/21/13 to climb 7,235 meters. Each activity (Ride) must be logged on the Site and cannot be inputted manually. For more information regarding how to log activities on the Site, please see Strava’s How It Works page (http://www.strava.com/how-it-works). If You successfully climb 7,235 meters between 07/14/13 and 07/21/13, You will be a prize winner, subject to Sponsor’s verification. Any form of entry and participation in the Skill Challenge other than that described herein is void. Each prize winner will win a digital Challenge finishers badge (Approximate Retail Value ("ARV"): $0. Total ARV of all prizes: $0. Limit one (1) prize per person. No transfer, substitution or cash equivalent for prize will be made, except that Sponsor, at its sole discretion, may substitute a prize (or component of prize) of equal or greater value for any reason. Any depiction of prize, in Skill Challenge materials or otherwise, is for illustrative purposes only. All prizes are awarded AS IS and WITHOUT WARRANTY OF ANY KIND, express or implied, (including, without limitation, any implied warranty of merchantability or fitness for a particular purpose) by Sponsor. All prizes, including prizes shipped outside of North America, will be sent via U.S. Postal Service with the appropriate international postage (where applicable). We assume no liability for non-deliverability. In order to avoid shipping goods outside the U.S., Sponsor reserves the right to ship the Approximate Retail Value of the item via check or alternate payment as a substitute for the merchandise prize UP TO A MAXIMUM VALUE OF $350 USD. Sponsor reserves the right to cancel the Skill Challenge for any reason. In the event that the Skill Challenge is cancelled or postponed for any reason whatsoever, the ARV of the prizes will be awarded to the extent required by law. Sponsor also reserves the right to remove from or to deny entry to the Skill Challenge to any entrant who engages in a non-sportsmanlike or disruptive conduct, or acts with the intent to annoy, abuse, threaten or harass any other person participating or involved with the Skill Challenge. ALL TAXES ARE THE SOLE RESPONSIBILITY OF THE WINNERS. Any required tax reporting forms will be furnished to the appropriate tax authorities. Sponsor will announce the potential winners of the Skill Challenge within one (1) week after the conclusion of the Skill Challenge on 07/21/13. All potential winners will be notified via the email address associated with the potential winner’s account and will be posted on Sponsor’s Site (http://www.strava.com/challenges/rapha-rising-2013). Prizes will be deemed to have been won when all conditions in these Official Rules and accompanying Terms (http://app.strava.com/terms) are met. To obtain the names of the winners, any person may mail a self-addressed, stamped envelope after days from the conclusion of the Skill Challenge to 500 3rd St, Suite 110, San Francisco, CA 94107. Attn: Winners’ List. Requests must be received no later than three (3) months after the conclusion of the Skill Challenge. The sponsor of the Skill Challenge is Strava, 500 3rd St, Suite 110, San Francisco, CA 94107. If You do not wish to receive any further notices from Strava regarding future promotional offerings, send Your name and address to: 500 3rd St, Suite 110, San Francisco, CA 94107. Attn: Opt-Out. You have not yet won a prize. The actual odds of winning any prize will depend upon an entrant’s ability to complete the Skill Challenge. Skill Challenge ends on 07/21/13. See Official Rules above for entry requirements and complete prize restrictions. Sponsored by Strava,500 3rd St, Suite 110, San Francisco, CA 94107.